Following a successful test at the ADAC Rallye Deutschland last August WRC Promoter, the company responsible for commercial aspects of the FIA World Rally Championship, has decided to use LiveU technology across 10 rallies this year. 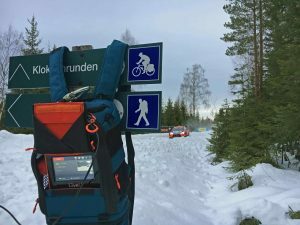 Ruth said, “we are using LiveU in conjunction with our RF and satellite workflow, allowing us to significantly expand our coverage without having to worry about access to certain parts of events or rely on motorcycles to deliver the additional captured footage to us. 2018 saw The FIA World Rally Championship (WRC) reach its best ever global airtime figure of 14,208 hours over last season’s 13 rounds, according to Nielsen Research. The WRC, recognised by the Fédération Internationale de l’Automobile (FIA), has a long and celebrated history, with 14 rallies around the world forming the 2019 series. WRC Promoter handles all the TV production, including all the broadcast formats, as well as the marketing of the series and sponsorship rights. It also works to increase the number of participants and explores new venues for the calendar.